Sometimes, teenagers can be the worst. They think they know everything, talk in a language called sarcasm, get grumpy easily, play their music too loud, and storm off during disagreements. If you’re the parent of one of these creatures and are getting tired of this behavior, fear not. We’ve got a mom for you. A single mom who goes by the name Estella Havisham–which she uses as a way to protect her identity, as a domestic abuse survivor–has become an internet sensation overnight, by accident. She recently became frustrated with her 13-year-old son because he lied about his homework. Even worse, he said his mom wasn’t his boss, and claimed he could pay his own way as a result of his earnings making videos for YouTube. So, what’s an angry mom to do? In Estella’s case, she wrote a letter to her son and posted it on Facebook. The letter, which is below, details his new chores and an itemization of his rent contributions, which total to $717. Personally, we love the unabashed fierceness of the last sentence: “If you decide you would rather be MY CHILD again instead of a roommate, we can negotiate terms.” This is a business deal we like. Sure, maybe this seems like extreme parenting, but honestly, it’s pretty awesome. 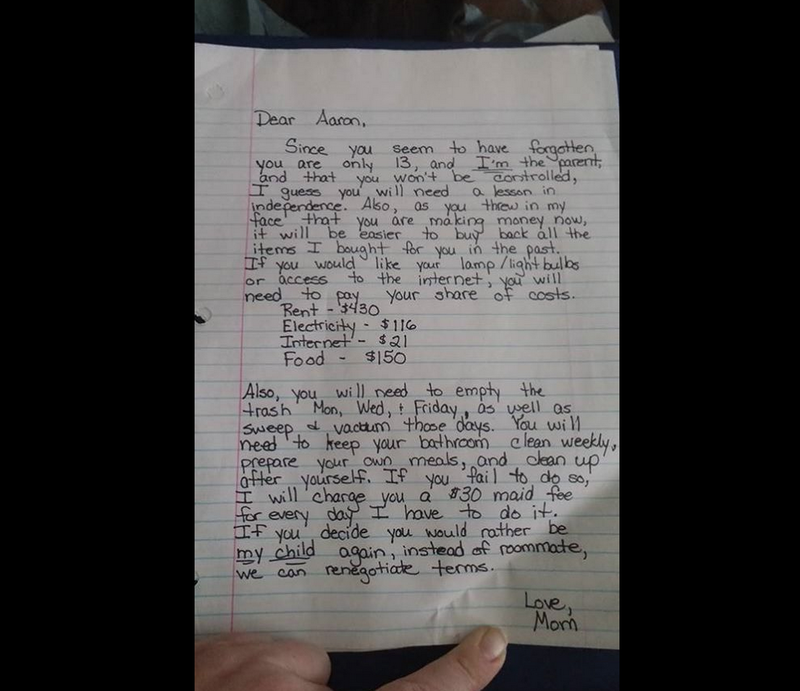 While her son initially crumpled up the letter, he has since apologized, and continues to make efforts around the house.